Unquestionably the city’s most iconic species of wildlife, and inspiring perhaps as many fans as foes, the pigeon (Columba livia, also called a rock dove) has become a quintessential New York character. Though the birds originally hailed from Europe, Northern Africa, and India, they followed early settlers into the eastern U.S. as domestic animals in the 1600s, and since then, expanded their range into North and South America (and, of course, into all of our boroughs). Some facts about our ubiquitous feathered friends: the pigeon population in New York City is estimated to exceed 1 million, they mate for life, and they can live for more than 15 years in captivity. One of the reasons for their success is their adaptability — one of the universal trait of New Yorkers. Though they originally found shelter and safety by living on cliffs, ledges, and seaside caves, now they’re at home on our windowsills, roofs, train overpasses, and in our park fountains. The tradition of urban pigeon keeping is a longstanding one and probably arrived in New York City along with European immigrants. Meanwhile, pigeon racing in the city has been recorded as far back at the 1800s. 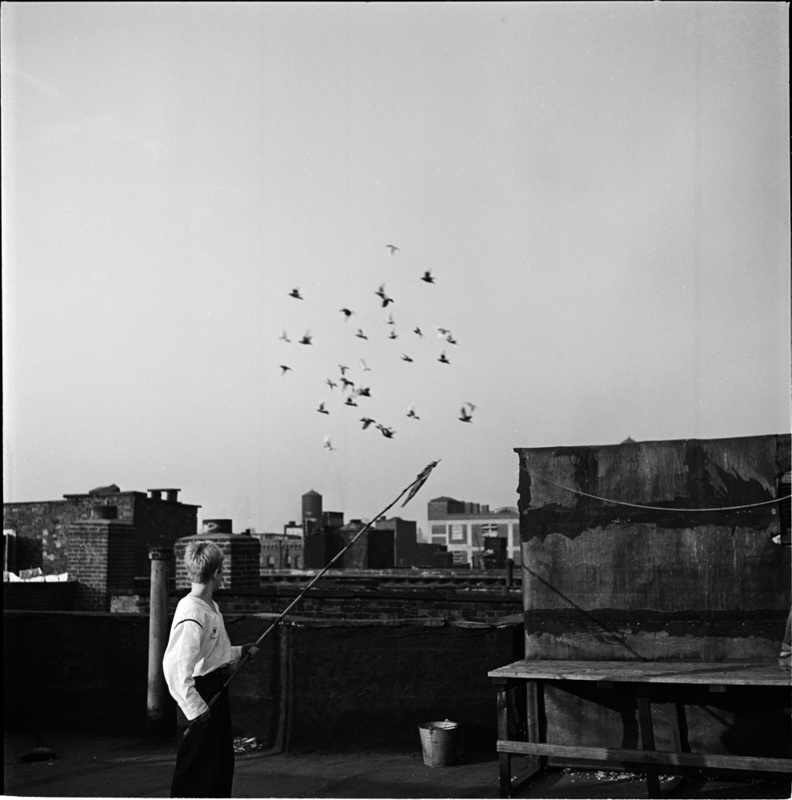 In the 1940s and 50s, the rooftops of the Lower East Side were dotted with pigeon coops. Today, the pastime has mostly moved out of Manhattan, but pigeon fanciers and racers can still be found tending their flocks on the rooftops of Brooklyn and the Bronx. 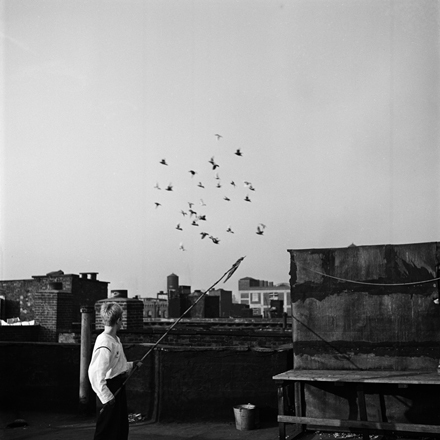 As part of his 1947 series of images of Mickey the Shoeshine boy, who we’ve profiled before, Stanley Kubrick took multiple images of Mickey tending to his pigeons. 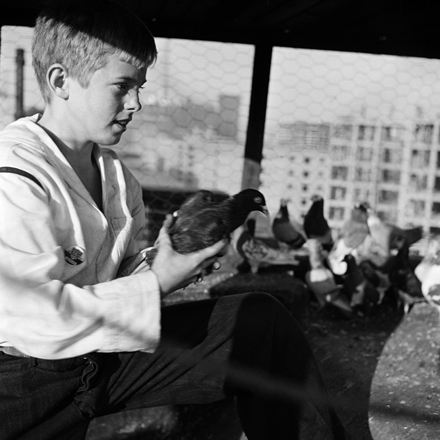 He sits with them in the coop, feeds them and lets them out to fly around the skies of his Brooklyn neighborhood. Since many pigeon fanciers mention picking up the hobby from a parent or grandparent, we can assume that Mickey, too, probably learned about the care and keeping of pigeons from an adult in his life. The long stick he’s holding is a pigeon-keeping tool that’s still in use today. By placing a piece of fabric or a plastic bag on the end of a long wooden or bamboo pole, one can signal the pigeons in the air and call them back. 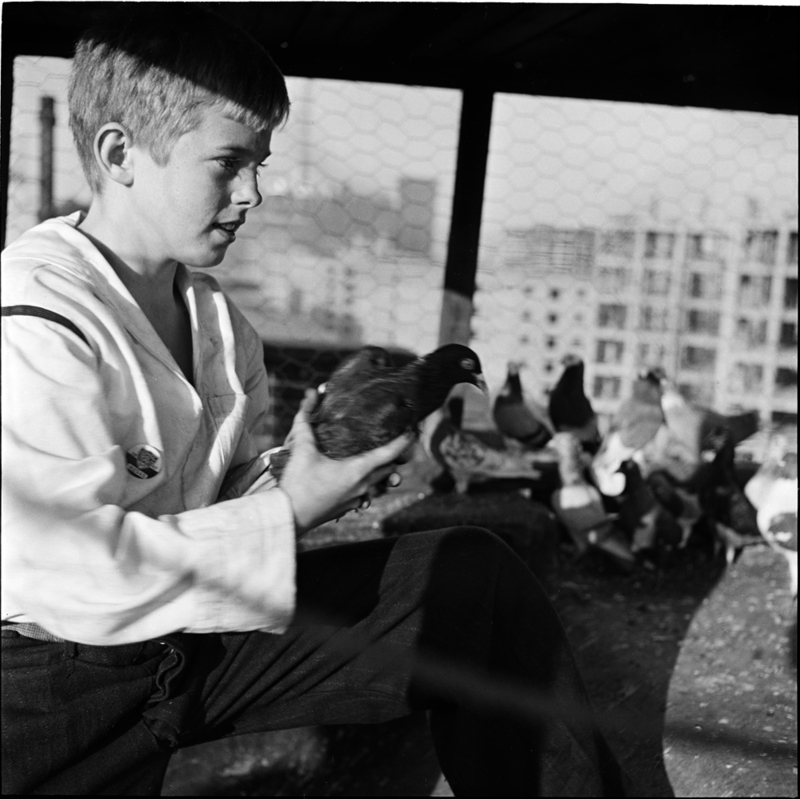 Then the stick can be used to corral the pigeons into their coop for the night, as demonstrated in this image by Roy Perry. 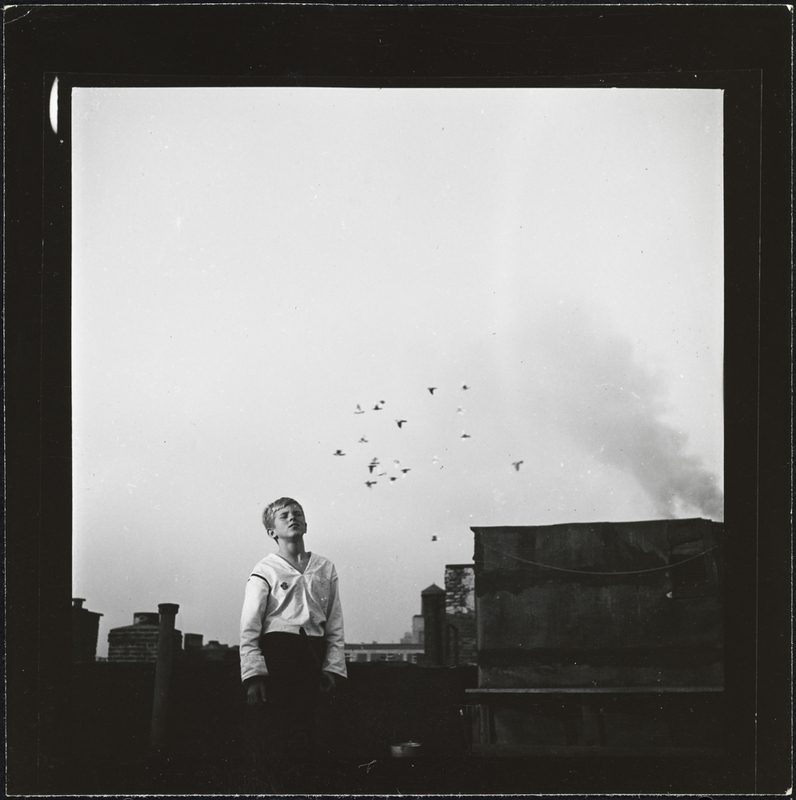 Perry, a Lower East Side native, was the first official photographer for the NIH (National Institutes of Health), and captured some of the Lower East Side’s pigeon keepers in 1940. The images he took show the variety of rooftops and coops these men had constructed for their pets. The customization was necessary because, even now, fanciers rarely keep only a few pigeons. Many keep hundreds of the birds at a time, though this number fluctuates as flocks get mixed up with each other and some birds simply move on. Roy Perry. 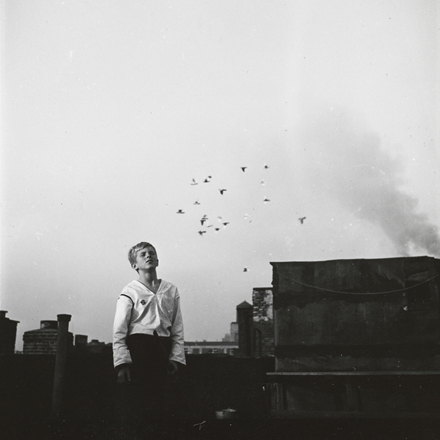 Man on Roof Tending Pigeon Brood, Third Avenue, ca 1940. Museum of the City of New York. 80.102.178. Though pigeon fanciers are a rare breed in the city today, the traditions they follow are still very much alive. And this summer, New Yorkers who despise these birds as “rats of the air” may change their impression of the birds as they take in Creative Time’s new public artwork, Fly By Night, at the Brooklyn Navy Yard. Audiences will witness a massive flock of pigeons outfitted with small leg bands fitted with tiny LED lights twirl, swoop, and glide above the East River–a show that pays homage to pigeon keeping, both in New York and farther afield.